Chandler Bing works as an IT Procurement manager who specialises in statistical analysis and data reconfiguration, a profession which none of his friends can relay. He has been best friends with Ross Geller since college and after many failed relationships becomes romantically involved with Ross’s sister Monica Geller. Chandler is the funny guy of the group and struggles to not make a joke of any situation, regardless of how serious it is. Born in Williamstown, Massachusetts, he now currently resides in Los Angeles. His birth date is August 19th. 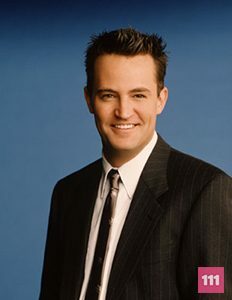 Mathew Perry is perhaps best known for his Emmy-nominated work as Chandler Bing on NBC’s long-running series “Friends”. He has also earned praise for his work in a broad range of film and television projects. Perry has completed an upcoming pilot for Showtime entitled “The End of Steve”, in which he stars in the title role as an ego maniacal local talk show host on a reluctant path to redemption. Perry also co-wrote the script, with Peter Tolan, and serves as a co-executive producer on the project. A four-time Emmy nominee, he received his latest Emmy nod, for Outstanding Lead Actor in a Miniseries or Movie, for his work in the title role of the 2006 true-life TNT telefilm “The Ron Clark Story”. In addition, Perry was honored with Golden Globe and Screen Actors Guild (SAG) Award(R) nominations for his portrayal of the dedicated teacher who left his home in North Carolina to teach in one of New York City’s worst schools and went on to win the coveted Disney Teacher of the Year Award in 2002. In 2006, Perry returned to series television to star in Aaron Sorkin’s NBC drama “Studio 60 on the Sunset Strip” in a role that was written for him. He had previously worked with Sorkin when Perry played the recurring role of Joe Quincy on the series “The West Wing”, garnering back-to-back Emmy nominations in the category of Outstanding Guest Actor in a Drama Series, in 2003 and 2004, for his work on the show. Perry received his first Emmy nomination in 2002 for his starring role on “Friends”. During his ten seasons on the show, he also shared in a SAG Award(R) and six more SAG Award(R) nominations for Outstanding Ensemble in a Comedy Series. On the big screen, Perry has starred in the independent feature “Birds of America”, which premiered at the 2008 Sundance Film Festival. Directed by Craig Lucas, the film also stars Hilary Swank, Lauren Graham, Ben Foster and Ginnifer Goodwin. The year before, Perry starred in the indie feature “Numb”, directed by Harris Goldberg and also starring Mary Steenburgen, Kevin Pollak and Lynn Collins. Perry also executive produced the film, which premiered at the 2007 Tribeca Film Festival. He previously starred alongside Bruce Willis in the hit comedy “The Whole Nine Yards”, and re-teamed with Willis in the sequel, “The Whole Ten Yards”. His other film credits include “Serving Sara”, opposite Elizabeth Hurley; “Three to Tango”, with Neve Campbell, Dylan McDermott and Oliver Platt; “Almost Heroes”, with Chris Farley and Eugene Levy; Andy Tennant’s “Fools Rush In”, opposite Salma Hayek; and “A Night in the Life of Jimmy Reardon”, starring River Phoenix, which marked Perry’s first feature. In May 2003, Perry realized a long-held goal when he made his professional stage debut in London’s West End in David Mamet’s “Sexual Perversity in Chicago”, with Minnie Driver, Hank Azaria and Kelly Reilly. The production broke the record for the largest box office advance for a West End show. Behind the camera, he made his directorial debut in 2004 with an episode of the comedy series “Scrubs”. Perry also appeared in the episode as a man willing to donate a kidney to his father, who was played by his real-life father, actor John Bennett Perry. At age 15, he moved to Los Angeles to live with his father. In addition to performing in several high school stage productions, he was an avid tennis player, ranking number seventeen nationally in the junior singles category and number three in doubles. In July 2005, Perry returned to the athletic arena to host the ESPY Awards. The broadcast earned the highest rating in the history of the ESPYs. In addition, Perry is a longtime supporter of the Lili Claire Foundation, and hosts their annual gala to raise funds for those born with Williams Syndrome and other neurogenetic birth defects.